Catching up in Muscat and Riamfada might fly with me. I like to bring you all up to date with us in Muscat. When I first came here, and after the initial stay in hotel, I found and moved myself into a furnished apartment in Al Ghoubrah signed on a 3 month lease. I decided that a more permanent place should be agreed to by my wife before that lease is signed. My wife joined me here two months already. But then, with the 2008 Olympics , and financial tsunami, and other stuff of settling in, I had not the energy to update this as often as I wanted. 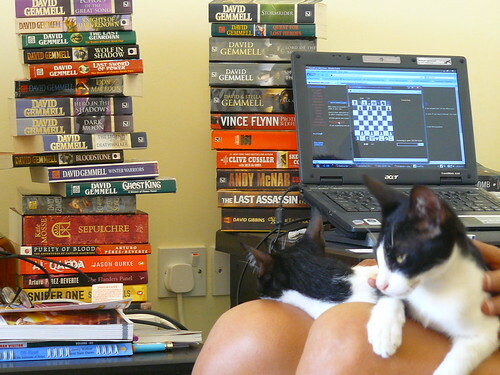 The photo below showed the key reasons why, Internet chess, DG books and beasties. Dommy is kitty looking at you and the other is Katie looking at some of my DG books making up her mind which to chew. While they look like kitties and meow like kitties, I suspect that they are aliens in disguise. And of course, they are on my knees. I finished all the DG books, including a stack of them brought to me by my wife when she came here. If you like good books, do read DG. Start with his Rigante series. My wife and I roamed about Oman, to the stark majestic mountains inland as well to the coast down to Sur. We covered a tiny fraction of this rugged beautiful country with so much more to go to. You can see photos of our travels and life of Oman in her Flickr. She can write and write , so those with insomnia and without good DG books can go there and read. 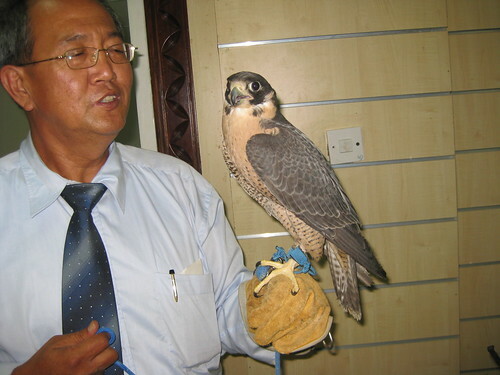 Some time back in Dubai, falconry was widely practised there and falcons were for sale. Here are a few photos from that time. The falcons were gorgeous and majestic in their beauty. But then, the property prices in Dubai were so high that I could not have afforded a villa to own a falcon properly. In Oman, the cost of leasing villa is much lower and well within my reach. I knew Arabs have this strong tradition of falconry. 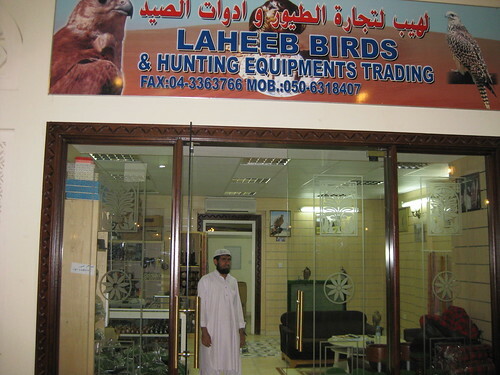 I seen falcons for sale in Riyadh and in UAE. 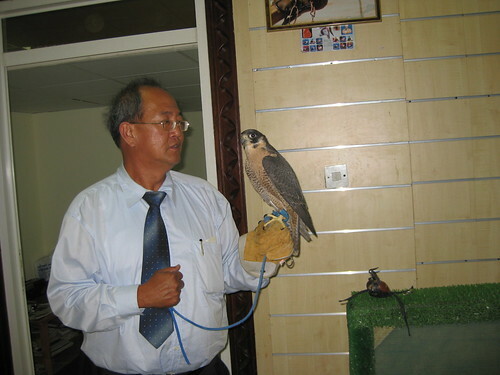 I had this thought of having a falcon for companion and not just for hunting. So in Oman, I checked and checked and was surprised to find no falcons or falconry practised here. It turned out that the Sultan of Oman is a strong conservationist. Arabs with falcons from UAE and Saudi Arabia descended onto Oman like an army and ravaged the nature reserves. Even worse was done with guns. So the Sultan here banned falconry and hunting to conserve the local fauna. 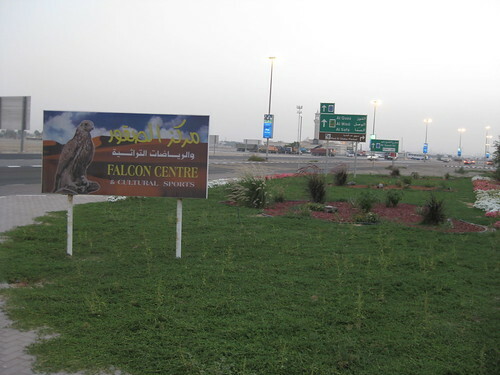 Even while I regret that I was unable to get a falcon here, I have to applaud the sentiment and the basic aim of the ban on falconry and to wish the Sultan and Oman well on his desire to preserve the little thats left of the wildlife here. I have been to the bird shops as I have settled in. I found that there was a ban set in place 4 years ago on import of birds and parrots. I had yearned for either macaw, (BG or Scarlet or GW) and/or Electus. None were to be around. There were IRN and Greys. I find it difficult to buy grey from the shops because of my Tinkerbell. At any rate, none of the grey touched me in the heart. I left word with vets and friends in case that expat who must leave Oman and unable to bring their birdies with them like to settle a deal with me. I hoped to get my macaw or Eckky that way. My 3 month lease on apartment was coming to an end. We were house hunting and at the end, we found a delightful villa in North El Hail that suited our needs. Many of the villas we had seen were built in the Oman style. A complex arrangement of small rooms geared to seregating the females from the males. Nice if you have a harem of 3-4 wives, but I do not have 3-4 wives. One is already more than I can handle. The villa was in Western style, roomier and more space. That had 3 bedrooms. We accepted that and moved in early Oct. We had to buy furniture and we got sensible sturdy hardwearing stuff. Able to bear kitties and birdies that we learned from our experiences. We do not have to care about badly treated furniture anymore as that will be our furniture. One of the bedroom will be dedicated as our bird room. That was about the best bed room with windows on opposite walls. That also allow a crossflow of air. This will be the room that the bird will be kept and trained in before graduating to the rest of the villa. But why do I resume this blog? Its because a new chapter might be unfolding. My friends and collegues here know of my attachment to birds. Yesterday, a note was sent to me by RC. An expat here, Ms JD found a parrot and trying to track her last caregiver. I called Ms JD. We spoke and we met later that day. We felt it best to try to find the real owner to return that parrot to. But failing that, JD liked the parrot to go to a good home and be looked after well. She said she had been to Tinkerbell website. In her earlier equiries, she was also told by other of her friends of me. She would be keeping that parrot over the next couple of weeks. If the earlier owner cannot be located, she might wish to appoint me as the caregiver. We had a good rapport in our hour long meeting and going over some hard prints of Tinkerbell and Yingshiong. It might be possible that she be attached to that parrot herself, in which case I still will help her all that I can. It might be possible that another chapter of Shanlung with a parrot might start. That parrot had no identification ring and therefore , no papers. Even with papers, I am so aware of the difficulty of taking that parrot with me later. With no papers, no hope at all. It will be another emotional and painful goodbye. While I liked macaw or Eckky, neither can I, or will I turn away a rescue should it be decided that parrot come to me. I accept what fate might throw my way. Over the next few days, I will set up all thats required in the bird room be it for this rescue or whatever that come my way. I will start the process of Tinkerbell mash. Some will be presented to Ms JD, and if she wanted to keep the parrot, I will give her all the mash. I deliberately do not say what parrot that was for obvious reasons until the right time. But I have the name already. That came from one of the character of David Gemmell books. In time to come, you will know if Riamfada lives and fly with all of us and get to travel with us all over in Oman. So very pleased to read your latest entry. That is quite a stack of books, which says something about needing other maybe livelier activities, such as training and enjoying another bird. If it is to be, you will have Riamfada....or another bird with credentials to allow you to take it with you when you leave the country. You put your soul into the bird, and it is a sweet sorrow when you know from the start that parting is a certainty. For you, and Joy, I wish a good-natured bird with all the papers to allow you to bond for many many happy years together. Ciao ciao, and peace be with you always.